Posted by Jenny in memoir, nature, Smoky Mountains. I was going through my file cabinet the other day and discovered a folder labelled simply “Dad.” It turned out to contain an odd assortment of photos, copies of old letters, and even some ancient tax returns. Near the top I found copies of correspondence between Dad and the Brooklyn Botanic Garden. The subject: chestnut trees. He had apparently heard of a project at the Botanic Garden to locate stands of healthy mature chestnuts. As it happened, he and my mother had recently come upon a group of chestnuts on one of their walks in northern Virginia. As I look at the letter and reread it now, I experience the powerful confluence of two things: the subject of the trees, and the personality of my father. Dad was always a very modest and soft-spoken person, and he seemed to become more, rather than less, uncomfortable in social situations as he got older. If you had forced him to chat with a stranger for an hour or two about things of no personal interest, that might have been his idea of hell. I sympathize with that feeling. 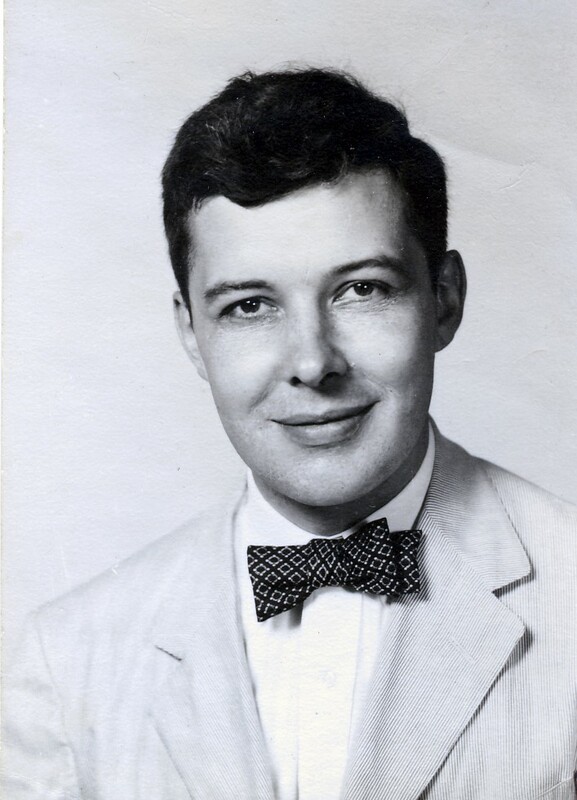 But Dad was a beautiful writer, and he came into his own in his correspondence. I can picture him sitting down comfortably to his typewriter and working out the turns of his sentences. His grammar was perfect, his style formal without being stilted. He could get away with using words like “aforementioned” and phrases like “Could you kindly inform me.” He loved to communicate via the written word. His letter to the Botanic Garden, dated Dec. 1, 1971, begins: “Dear Sirs: I have heard that you are interested in learning of surviving mature specimens of chestnut trees, and are attempting to find a blight-resistant strain. My wife and I have come upon a group of trees not far from here which seem to be mature chestnuts and, on the whole, healthy. The oldest, with a girth of 68″, is shown in photos 1, 2, 3… ” And he goes on to discuss what is shown in a series of seven enclosed photos. The response may have been disappointing, but that would have been softened by the fact that Mr. Kalmbacher at the Botanic Garden had taken the time to carefully examine the samples my father had sent, and that the polite, full-page, neatly typed response conveyed the news about ongoing work with hybrids. My father would have been heartened if he could have known about persistent efforts to develop a blight-resistant hybrid. In the Smokies, there is a breeding program that involves taking flowering American chestnut sprouts and grafting them onto blight-resistant Chinese chestnuts and hybrids. The offspring are then back-crossed with the Chinese chestnut. And there are some fairly large chestnuts in the Smokies. This link shows a beautiful chestnut in the Tremont area that is going to be used for pollinating purposes (thanks, Adam Beal, for sharing the link). I always enjoy looking out for chestnuts. Two friends recently found one on the Cat Stairs that was 15-20′ high, healthy in appearance, about 3″ in diameter, with at least 15 burrs. Hearing about that set me to looking for chestnuts on my recent Rainbow Falls/Bullhead hike, and I saw several in the 3200-3700-foot elevation section of the Bullhead trail. And I always think of Dad when I see one. 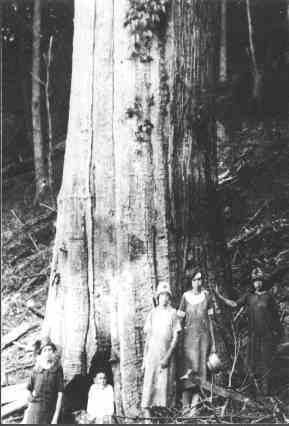 Chestnut in the Smokies, turn of the century. 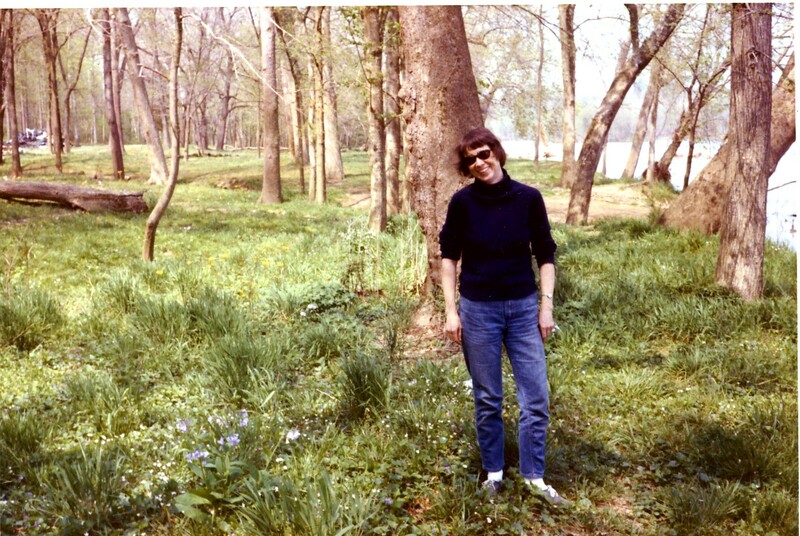 Mom on a walk along the Potomac, mid-1970s. She would have been in her early 50s. The ground is spangled with Virginia bluebells. One might think that since I am such a dedicated hiker, I must have grown up in a family constantly engaged in vigorous, athletic, outdoor activities—hiking, camping, canoeing, archery, God knows what. This was not the case. We were a family of quiet, pale, bookish people. We did not go on hikes, we went on Walks. I came to realize over the years just how non-outdoorsy my family was, each time my longtime companion, Bob, pointed out yet another place, seemingly across all of New England, where his family had gone camping. It became a running joke, as we drove along through western Maine or central New Hampshire or southern Vermont: “Oh, my family used to camp here.” The thing was, his Mom and Dad were not the slightest bit athletic. Yet they were quite willing to load up the car with a giant tent that would be set up quasi-military style with trenches dug all around, the lawn chairs and the tarp set up, the food set out on the picnic table, as the kids ran down to the lake or the river or whatever the attraction was. The point was, they were putting in many, many hours enjoying the Great Outdoors (more words that need to be capitalized). My mother and father loved nature, but we never stayed out overnight in it. I’m not even sure exactly why not. We didn’t have any of the gear, and we never acquired it. It wasn’t that any of us minded getting dirt under our fingernails or slapping at a few mosquitoes or maybe encountering a snake or a bear. It just… never seemed to occur to us. 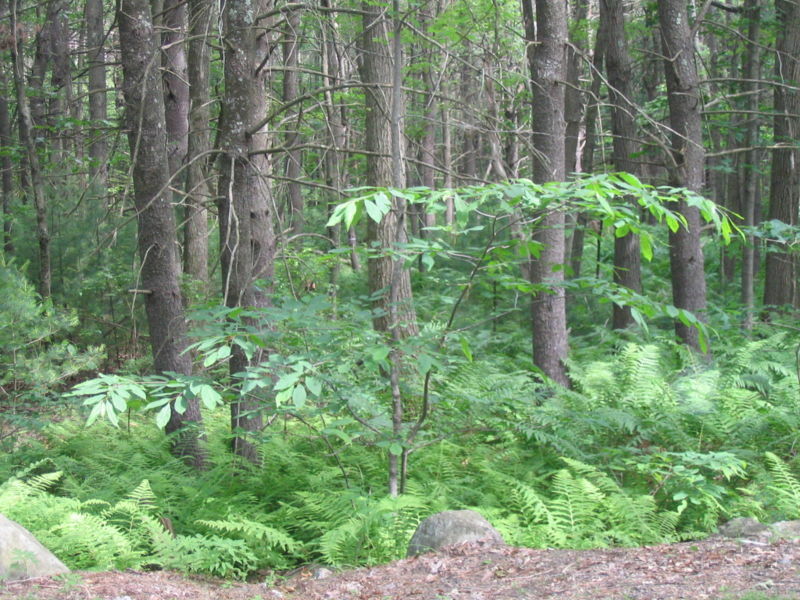 At any rate, in the area where I grew up, in Arlington, Virginia (the family moved to Massachusetts later on), we would take walks in the woods right behind our house, in Glencarlyn Park. 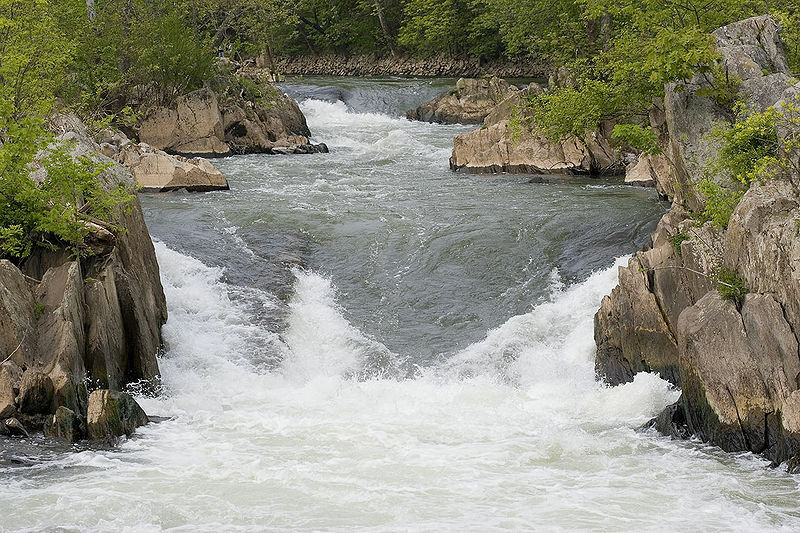 Further up the Potomac, Great Falls was a popular destination, or the C&O Canal towpath, or Sugarloaf Mountain in Maryland. We probably seldom walked more than five miles. But we walked almost every weekend, and Mom and Dad continued to walk together after the three kids had left home, both of them taking walks up to within a year or so of when they died, Dad in 2001 and Mom in 2007. Mom and Dad had slightly different angles on the woods. My father loved to identify trees and to locate especially large specimens of different kinds (I will write about this in my next post). Mom knew her plants, trees, and animals pretty well, but for her, that was not really the main purpose of being in the outdoors. For her, the Woods were a mystical kind of place. 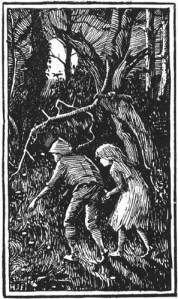 It went back to her childhood, full of the classics of children’s tales such as Andrew Lang’s Red Fairy Book. As I have written elsewhere, the forests of those tales were full of danger and mystery. They were not a place where, for example, children’s environmental consciousness would be raised. Hansel and Gretel. Illustration by H.J. Ford. 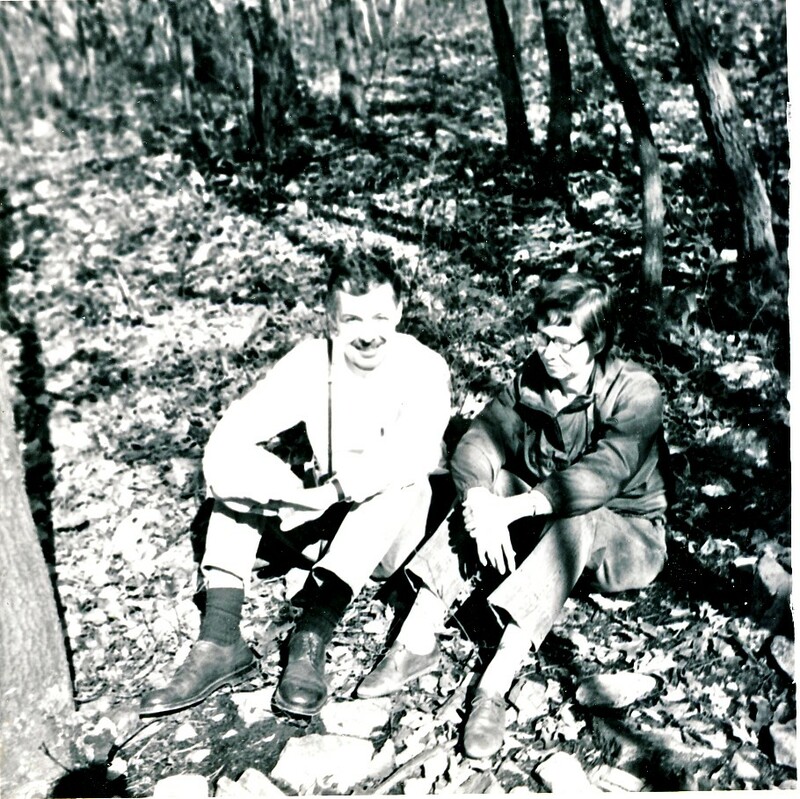 For Mom, the Woods were a place where mystery, beauty, and science came together. I will try my best to explain. The mystery was a deep sense of awe about the place. Not exactly reverence—that seems too deferential, or too pious, or something. Just a gut-level feeling that something extraordinary was going on out there. Mom’s sense of beauty caused her to notice and admire things that were not usually seen in the first place, let alone focused on. She would point out to us the texture of a blanket of moss, or the way a tree’s shadow was moving in the wind, or the sound of rain gently pattering on the leaves. She gave the three of us kids a tremendous gift: the ability to see things that did not neatly fit a word or a concept or a label. Now, the science part. Again, this had nothing to do with environmental education—not that there’s anything wrong with that. Mom, being the unconventional person she was, had an interest in the philosophy of science, especially the oddities of quantum physics. It was an interest she took up in middle age and studied deeply. So when she went for a walk, she tended to find things that fit some pretty abstract ideas she had about the way the universe works. The best way I can convey this kind of thinking is to share one of her poems. Mom, Jenny, Peter, Dad in back, Betsy in front. 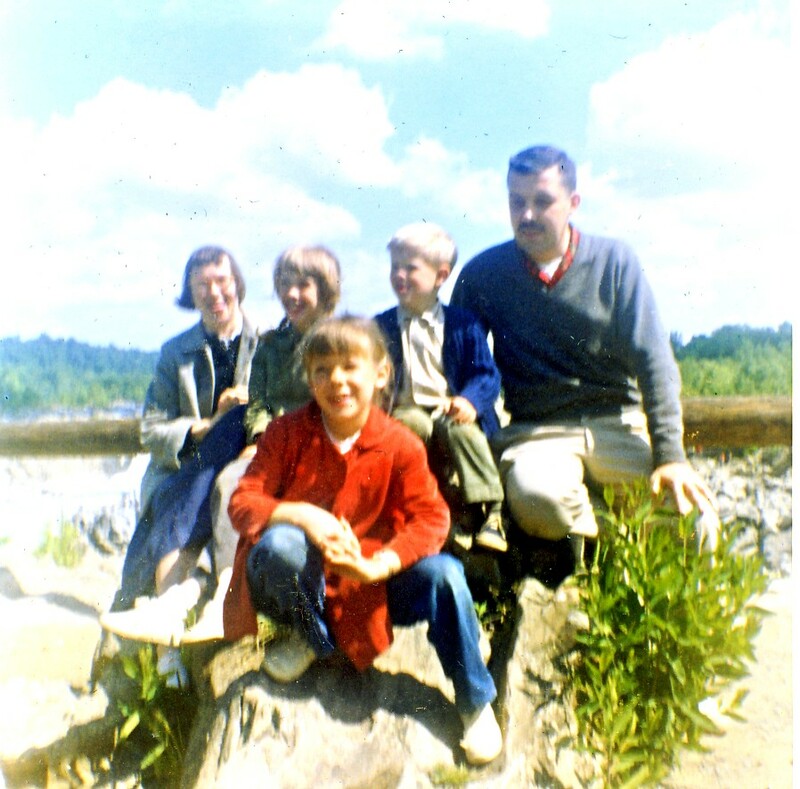 At Great Falls, 1961. I’ll be peering at my family through the lenses of old cameras from time to time. 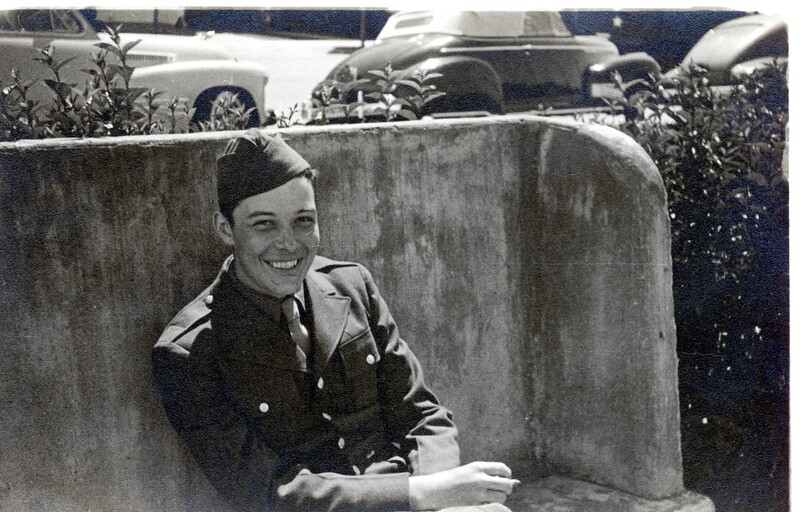 This is a picture of Edward W. Bennett on leave from basic training in Mississippi in 1943. He was visiting his sister Phyllis and her husband Rod. He would go to New York to complete a nine-month course with the Army Specialized Training Program before heading overseas. For an account of part of Dad’s experience in the Battle of the Bulge, January 1945, please go here. 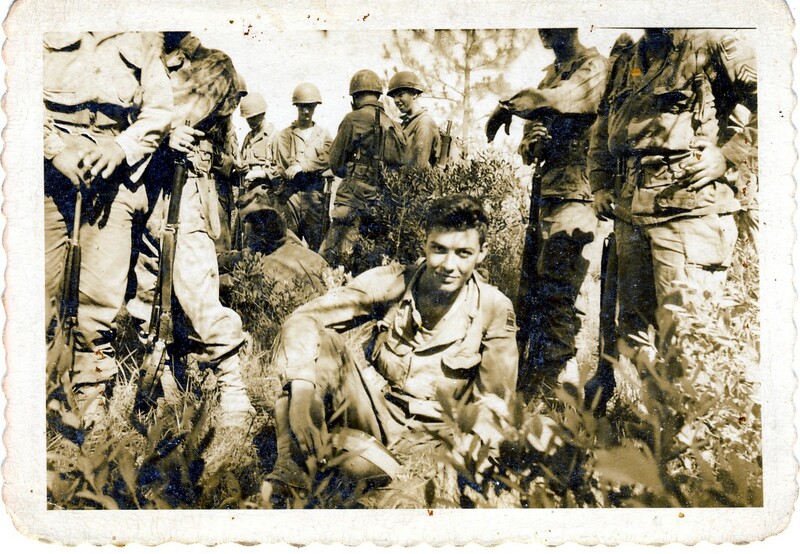 He was in Company D of the 1st Battalion, 330th Infantry, 83rd Division. Later in life, his knowledge of German would become essential in the writing of two books about German history between the wars. One was about the German financial crisis of 1931 and the other was about German rearmament during the 1932-1933 period. 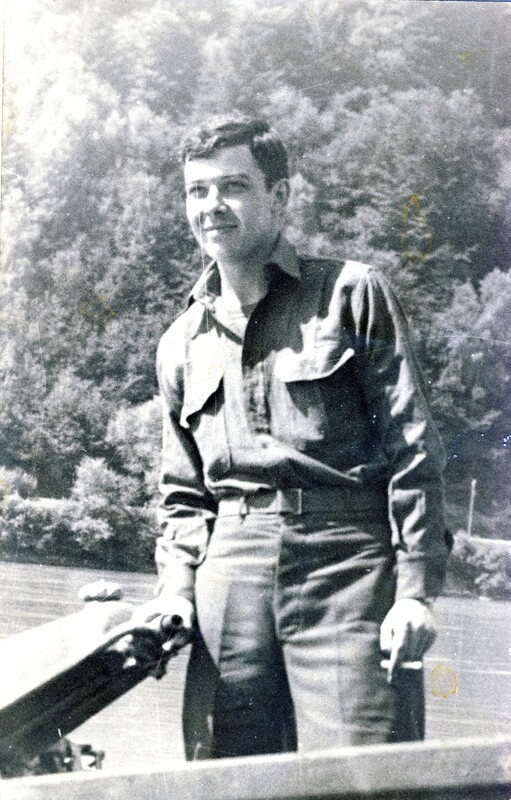 This picture shows him on the Danube in 1945 sometime after V-E Day. 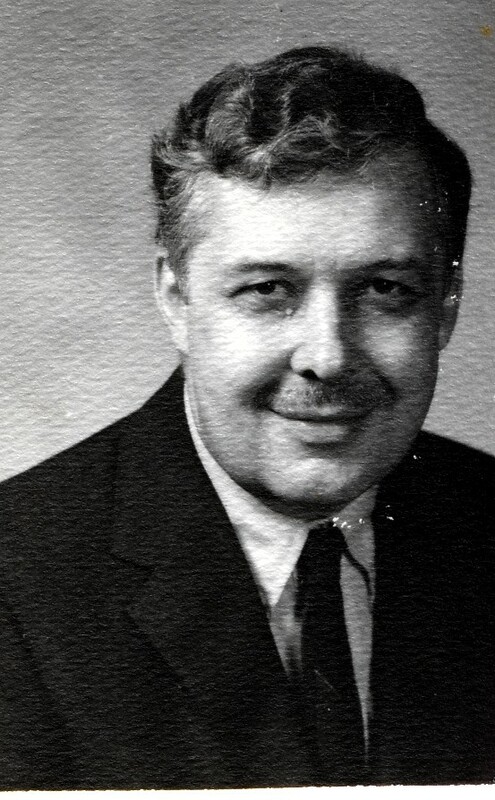 When Dad passed away in 2001, having suffered from a severely debilitating brain disorder called Lewy Body Disease, I had trouble at first in pushing past the troubling, unhappy images of him as a frail and elderly man: the last year of his life was difficult. But as time goes on, I learn that I not only find pleasure in my personal memories of him but that I can also imagine him quite clearly as a young man, full of vitality and hope.